She is the last of a litter of nine pups that we rescued from a bad situation. 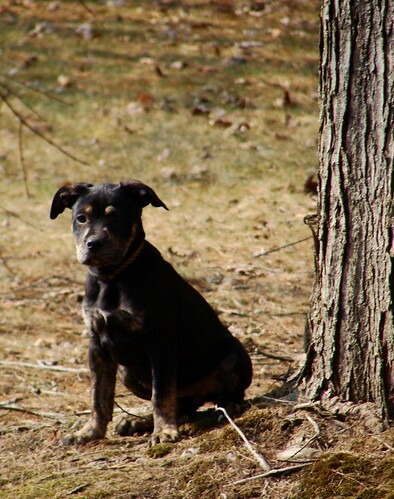 Mom was a 35-40# pit bull, and dad was a roaming labrador retriever. All of her brothers, and her one sister found forever homes, but poor Miss Galaxie is still here waiting. She likes it here, but would thrive in a home of her own. Galaxie is an active little pup, but has fantastic manners. She is currently 17 weeks old (she was 6 weeks when she came here to Red Rover)...and knows how to sit, how to get in her crate, and is housetrained. She walks well on or off-leash, has a great recall (coming when called) and is working on not jumping up to greet people. Galaxie has been socialized intensively, and has been living with rabbits, cats and other dogs and puppies. She settles in the house easily when out of her crate, but also loves her crate and is quiet when crated. Galaxie recently attended an off-leash hike with other dogs...and was a little rock star...everyone was amazed at her calm and gentle behavior and great recall! Gibbs is looking for a home! 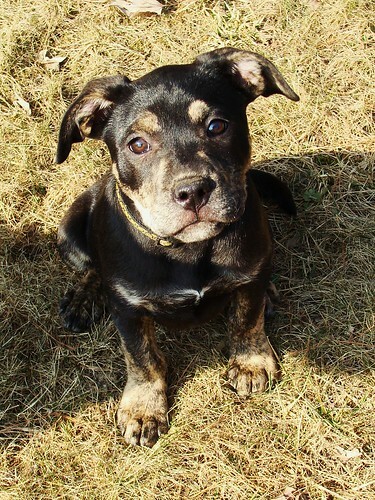 Gibbs is a 6 month old lab/pit bull mix puppy who is looking for a home of his own, though he loves it here at Red Rover. He is a wonderful little boy who knows a lot of skills and has terrific manners...especially for his age. He can sit, down, walk nicely on leash and has a great recall (coming when called). He works well off leash, and has a pretty good retrieve. He gets along with everyone here, including the cats and rabbits. Gibbs has been with us since he was 11 weeks old...and has come a long way! He accepts handling (ears, teeth, nail trimming, etc) and has had extensive socialization. He loves people of all ages, including kids and babies. He would be a great dog for somone looking to get into dog sports or Search and Rescue, as he has a lot of drive...and loves to work. Gibbs has started his flyball training and has a beautiful box turn on the shoot. He also has been on full-height agility equipment with no concerns. He never gives up...and will search for balls hidden in the woods, even looking up into the trees! For all of his drive though, he settles in the house quickly...and is crate trained (and quiet in his crate). There is a small adoption fee. Please email us at TheRedQueen4@red-rover.biz if you think you might be interested in this fantastic boy! Twister has been adopted! Congrats to her new family! Twister is looking for a new home! Twister is looking for a home where she'll get lots of attention and playtime. She is good with most other dogs, but does not like alpha females. She has not been exposed to cats. She loves to watch tv on the couch with you, and is very good at fetch. She knows sit, come, down, wait, catch, touch, crate, and off. She loves to go swimming in ponds or creeks, and will retrieve anything out of the water. Twister walks very nicely on a lease with a martingale collar She has attended an intro to agility class and a flyball class. She is clicker trained, and picks up on new stuff quickly. She rides well loose in a car, and is quiet in a crate. She is good for her bath and brushing and nails. Twister can climb low fences, and will dig under high fences. She does not leave once she is on the other side of the fence...but does look for stuff to get into. She has gotten into a horse field several times, but does not chase the horses. Twister loves to go for walks though, and would do well with several walks a day. She does have a funny bark (she sounds like a baby's toy)...but she has always had this bark, and there is nothing medically wrong with it. Because Twister loves attention, and is VERY treat motivated, she would be great at agility or freestyle. She is about 20 months old, 18" at the withers, white with black patches and brown eyes, and 30 pounds. She is a mix breed, possibly BC/Springer Spaniel...maybe some Sheltie thrown in for good measure. 2/15-27/08 Lyme's disease positive...treated. Suspected luxation of the right superficial digital flexor tendon...okayed by specialist to take 2 months off then increase activity back to a normal level. Summer has been adopted! Congrats Corey and Summer...have fun training in Search and Rescue! Summer is up for adoption! Right now, we have a lovely mixed breed named "Summer". She is originally from a rescue in North Carolina, and came to MD to be a Service Dog with Fidos For Freedom. Due to her prey drive issues, she is considered unsuitable as a Service Dog...but would make a lovely pet for someone without small animals at home. Summer is a about a year and a half old, and weighs just over 50#. She is in great shape, has been spayed and is fully vetted. She loves to play with other dogs, and loves to play with toys (though she does chew and swallow little pieces if the toy is not durable). Summer does not do well with cats or other small animals. She is crate trained, and is obedience trained, as well as knowing some Service Dog skills such as retrieving and tugging. She would make an excellent performance dog also...as she's active and nimble. Summer walks well on a front-clip harness or buckle collar. She gets along with all types of people, including kids over 6 years old (she's met a baby or two, but she might be too rambunctious for a small kid). She is up for adoption through Fidos For Freedom, but detailed information can be found by contacting us at Red Rover, as she's currently residing here.